As VMWare does not provide convenient and easy way to read RAW S.M.A.R.T values on ESXi hosts, a ported version of smartctl has been created, which is part of smartmontools to ESXi. 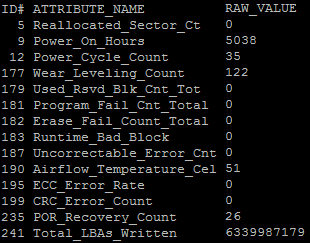 Below there is an example of an ESXi Host report without smartctl. The device analyzed is a Samsung SSD 850 EVO M.2 250GB used as a local Datastore. Warranty for this SSD is 75TBW. The next table shows the stats provided by ESXCLI, which are a bit more verbose. ESXi keeps track of all read and write operations to the disk, but the counters get reset when ESXi is rebooted. In the SMART Attributes section, there is a Total_LBAs_Written value (ID #241). In order to get Terabytes, we need to multiply this value with the sector size (512 bytes) and divide by 1099511627776 (1024^4). That gives us 3 of 75 TBW. Taking into consideration the parameter Power_On_Hours (SMART ID #9), which tells us that the device has been in use for about 200 days, we may prognose that this SSD will last for the next 13 years. Note: The use of this VIB is totally unsupported, proceed at your own risk. Tested with ESXi only. This is the review of an article. Online Marketing Manager at StarWind. In touch with virtualization world, may know stuff you are interested in.